Many backyards are simply a place to kick a ball and cut grass. When you look at your backyard do you see lawn mowing maintenance work or family fun? 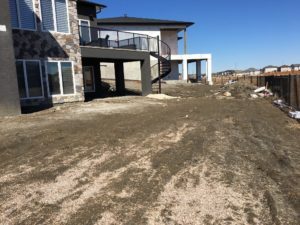 This blog shows before and after residences that took the plunge! With experts in design and complete in house construction staff we can change your “view” of your personal space. This first backyard is in Lindenridge area. 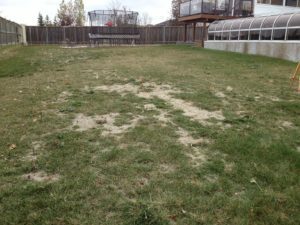 The picture shows how we first saw the backyard…..a blank slate for us to perform magic with! 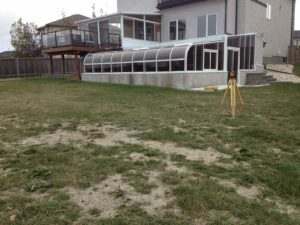 The yard was also sloped so we took elevations to help with a proper design. There are so many elements when you examine the finished product closely. The water feature was built by our in house trades people made of tile with a 3’ sheer descent. Young kids also wanted a fun water slide plus an extra spring diving board. The fire pit table and furniture is all available and on view in our Lagimodiere store. 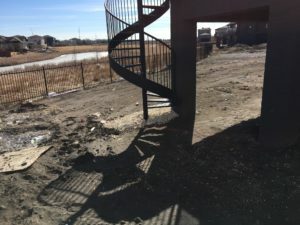 This backyard in Sage Creek was brand new and untouched. 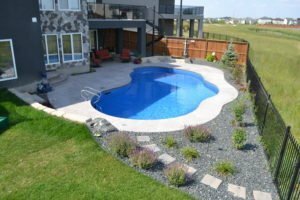 The homeowner wanted a company that could design and complete a finished backyard. Every last detail including the retaining walls, landscaping and furniture was provided by Aqua-tech. 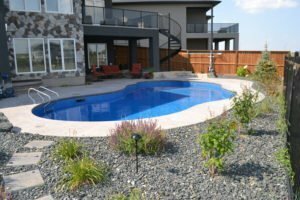 When every detail is accounted for and looked after by one company the finished project is that much more awesome and there is less stress for the homeowner during the process. Speak to one of our three in house designers to start your personal resort planning! 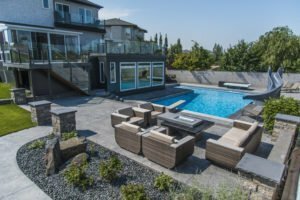 Book Your Custom Renovation Quote and Site Visit! Take the first step toward your beautiful new back yard paradise! 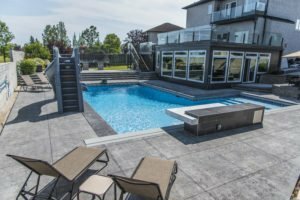 Let us know when you’d like to have your custom renovation quote and site visit and one of our professionals will contact you shortly. Book My Site Visit Today!